Two of the menu items in the Power User Menu are Command Prompt and Command Prompt (Admin). Power User Menu, which also known as Quick Access Menu, WinX Menu or Win+X Menu, provides quick and easy way to access popular system and management utilities. It’s first available in Windows 8, and the feature is now permanent and include in Windows 8.1, Windows 10 or later, and their respective server equivalent. 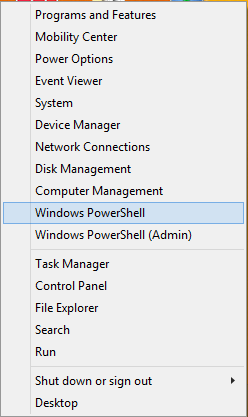 If you’re an administrator or developer working more in Windows PowerShell, the task automation and configuration management framework from Microsoft, it’s possible to change the shortcuts in the Power User Quick Access Menu to Windows PowerShell and Windows PowerShell (Admin), replacing the Command Prompt shortcuts from Windows 8.1 (Windows Server 2012 R2), as shown in figure below. Note: In Windows 10 Creators Update (v.1703 15063), the Control Panel option has been replaced with Settings. Right click on the Taskbar and select Taskbar settings. Alternative: Open Settings -> Personalization -> Taskbar. Under the “Taskbar” section, slide the toggle of Replace Command Prompt with Windows PowerShell in the menu when I right-click the Start button or press Windows key+X to On. To switch back to Command Prompt shortcuts, just slide the toggle to “Off” for the same option. The change takes effect immediately, and Windows PowerShell and Windows PowerShell (Admin) will be shown in the Power User Menu in place of Command Prompt and Command Prompt (Admin). Right click on the Taskbar and select Properties to open “Taskbar and Navigation properties”. Alternative: Open Control Panel -> Appearance and Personalization -> Taskbar and Navigation. 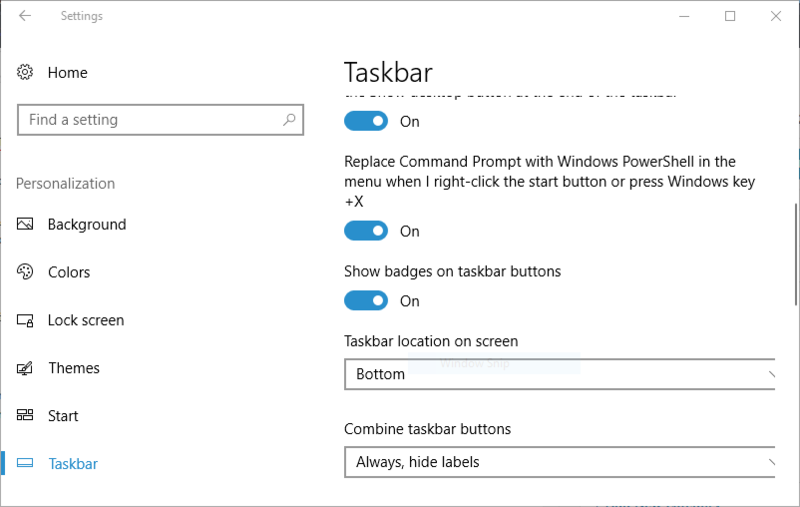 In “Taskbar and Navigation properties”, go to Navigation tab. Under the “Corner navigation” section, check the checkbox of Replace Command Prompt with Windows PowerShell in the menu when I right-click the lower-left corner or press Windows key+X. To switch back to Command Prompt shortcuts, just uncheck the checkbox of the same option. Tap or click OK. The change takes effect immediately, and Windows PowerShell and Windows PowerShell (Admin) will be shown in the Power User Menu in place of Command Prompt and Command Prompt (Admin).